In a large pot cook with boiling salted water cook pasta until its perfect for you. Meanwhile, prepare a large skillet over medium heat cook ground beef and chopped onions until brown. Stir in tomato sauce, sugar, salt, garlic, and pepper. Remove from heat. In a large bowl combine the cottage cheese, sour cream, softened cream cheese, green onion, and green bell pepper. To assemble, in a greased 11x7x1 1/2 inch baking dish spread half of the cooked and drained pasta. Top with half of the meat mixture. Cover with cheese mixture and remaining noodles and meat sauce. Sprinkle with grated Parmesan cheese. Bake in a preheat 350 degree F(175 degrees C) for 30 minutes. Let stand 10 minutes before serving. Remove the lamb shoulder from the fridge and allow to come up to room temperature. And reheat the oven at 200ºC/400ºF/gas 6. Pick most of the rosemary leaves into a pestle and mortar and bash with a pinch of sea salt. Peel and add 2 cloves of garlic and bash again. Muddle in the English mustard and 2 tablespoons of olive oil. 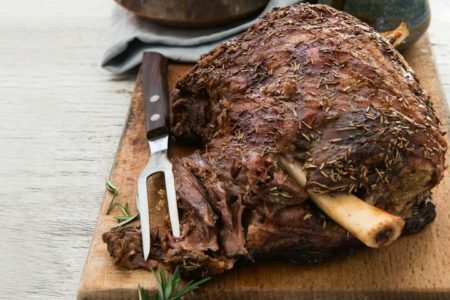 Slash the lamb all over with a sharp knife, season with black pepper, and then rub the rosemary mixture all over the lamb, making sure to get into all the nooks and crannies. Peel and thickly slice the onions, then place in a large deep roasting tray with the remaining rosemary and unpeeled garlic cloves. Drizzle with the balsamic vinegar and pour in 200ml of cold water. Place the lamb shoulder on top and roast for 20 minutes. Carefully remove the tray from the oven and cover tightly with a double layer of tin foil, then return to the oven, turn the heat down to 160ºC/315ºF/gas 2½, and cook for 4 hours, or until the meat pulls easily away from the bone. Remove the shoulder to a platter, cover loosely with the foil and leave to rest. Skim the fat from the tray, pick out and discard the rosemary, and squeeze the garlic cloves out of their skins. Place the tray on the hob over a medium heat, stir in the flour and cook for 2 minutes. Add 500ml of boiling water and the wine (if using), and stir well. Bring to the boil, and then reduce the heat to low and simmer for 15 minutes, or until thick and glossy. To make the root veg mash, peel and roughly chop the carrots and peel 2 cloves of garlic. Place in a large pan of boiling salted water over a medium-high heat and cook for 5 minutes. Meanwhile peel and roughly chop the potatoes and parsnips, add them to the pan of boiling water with the carrots then cook for a further 15 minutes, or until tender. Drain in a colander and leave to steam dry. Tip back into the pan, add a lug of extra virgin olive oil, then mash with a potato masher. Put some seasoning to taste. Shred up the lamb and serve up with the mash and onion gravy. Delicious served with steamed seasonal greens. 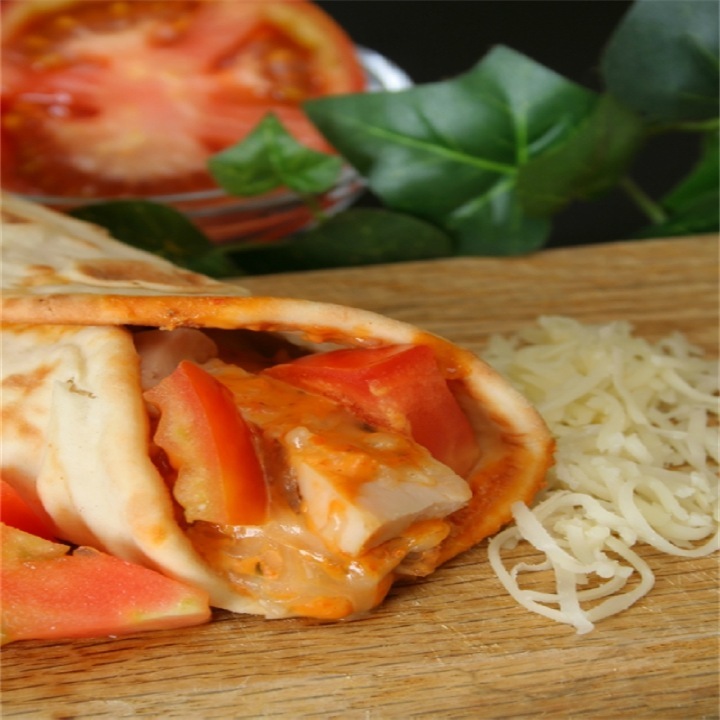 A very easy chicken recipe you can prepare for dinner and lunch. The dish can be ready to serve with 2hrs. This dish is best served with fried rice on it. Cut 1/2-inch deep slashes in the skin-side of each chicken half; 2 cuts in each breast, 2 in the thigh, and 1 on the leg; remove wing tips. Whisk rice vinegar, barbeque sauce, and garlic together in large bowl. Place chicken in bowl and turn to coat chicken in the marinade. Arrange chicken halves, cut-side down, in the bottom of the marinade bowl, cover the bowl with plastic wrap, and refrigerate for 1 hour. Preheat an outdoor grill for medium-high heat and lightly oil the grate. Remove chicken from bowl, pat chicken dry with paper towels, and discard marinade. Place chicken halves, skin-side up, on a plate and season with salt, pepper, paprika, onion powder, and cayenne pepper. Cook chicken, skin-side down, on the preheated grill for 3 to 4 minutes. Turn chicken over, close the lid of the grill, and cook, basting with remaining barbeque sauce ever 6 minutes, until no longer pink at the bone and the juices run clear, about 35 minutes. An instant-read thermometer inserted into the thickest part of the thigh, near the bone should read 165 degrees F (74 degrees C). Okra is a nutritional powerhouse used throughout history for both medicinal and culinary purposes. Once loved by the Egyptians and still used in many dishes today (such as the infamous gumbo dish), this pod-producing, tropical vegetable dates back over 3500 years ago. But still today, many are enjoying both okra health benefits and the vegetable’s edible delight. Okra is also referred to as lady’s finger and gumbo. Vitamin C – 16.3 milligrams. 27% RDA. Folate – 46 micrograms. 11% RDA. Vitamin A – 283 international units. 6% RDA. Vitamin K – 40 micrograms. 50% RDA. The vitamin K found in okra is known as vitamin K1, one of two beneficial forms. The other beneficial form is K2; K3 is synthetic and should be avoided. Niacin (Vitamin B3) – 0.9 mg. 4% RDA. Thiamin (Vitamin B1) – 0.1 mg. 9% RDA. Vitamin B6 – 0.2 mg. 9% RDA. Magnesium – 36 mg. 9% RDA. Manganese – 0.3 mg. 15% RDA. Beta carotene – 225 mcg. Lutein, Zeaxanthin – 516 mcg. Okra Promotes a Healthy Pregnancy An extremely important B vitamin for producing and maintaining new cells, folate is an essential compound for optimal pregnancy. The vitamin helps prevent birth defects like spina bifida and helps the baby to grow sufficiently. Vitamin C is also essential for fetal development. Okra is rich in both folate and vitamin C.
Prevent Diabetes Thanks to fiber and other nutrients, okra prove beneficial in normalizing blood sugar in the body, helping with diabetes. Prevents Kidney Disease Researchers found that regular consumption of okra can help prevent kidney disease. In the study, “those who ate okra daily reduced clinical signs of kidney damage more than those that simply ate a diabetic diet.” This also ties in with diabetes, as nearly 50% of kidney disease cases are caused by diabetes. Supports Colon Health Okra is full of dietary fiber, which is essential for colon health and digestive health as a whole. The fiber Okra provides helps to clean out the gastrointestinal system, allowing the colon to work at greater levels of efficiency. Additionally, the vitamin A contributes to healthy mucous membranes, helping the digestive tract to operate appropriately. Could Help with Respiratory Issues Okra contain vitamin C, which has been shown to help with respiratory issues like asthma. The consumption of fruit rich in vitamin C, even at a low level of intake, may reduce wheezing symptoms in childhood, especially among already susceptible individuals. Promotes Healthy Skin Vitamin C helps keep the skin looking young and vibrant. The vitamin aids in the growth and repair of bodily tissues, which affects collagen formation and skin pigmentation, and helps to rejuvenate damaged skin. Okra is full of vitamin C. Topical tip: Boil a handful of okra until soft. After letting it cool, mash it, and apply it to your face. After 5 minutes, your skin should feel smooth and rejuvenated. Rinse the rice in cold water while stirring briskly to remove any dirt. Drain the rice completely. Place the rice and the 6 cups of water in a medium sized saucepan and cover it with a tight fitting lid. Bring the water to a boil over medium heat. Allow the water to boil for 3 minutes and then reduce the heat to low and continue cooking 15 minutes without removing the lid. Remove the rice from the heat and remove the lid (the water should no longer be visible). Turn the rice out evenly on a well-greased cookie sheet using a spatula or rice paddle. Sprinkle the rice with the vinegar, sugar, and salt while mixing with a spatula or rice paddle until the rice reaches body temperature. Keep the rice covered with damp paper towels or napkin until the rice is ready to use. Preheat oven to 300 degrees F (150 degrees C). On a medium baking sheet, heat nori in the preheated oven 1 to 2 minutes, until warm. Center one sheet nori on a bamboo sushi mat. Wet your hands. Using your hands, spread a thin layer of rice on the sheet of nori, and press into a thin layer. Arrange 1/4 of the cucumber, ginger, avocado, and imitation crabmeat in a line down the center of the rice. Lift the end of the mat, and gently roll it over the ingredients, pressing gently. 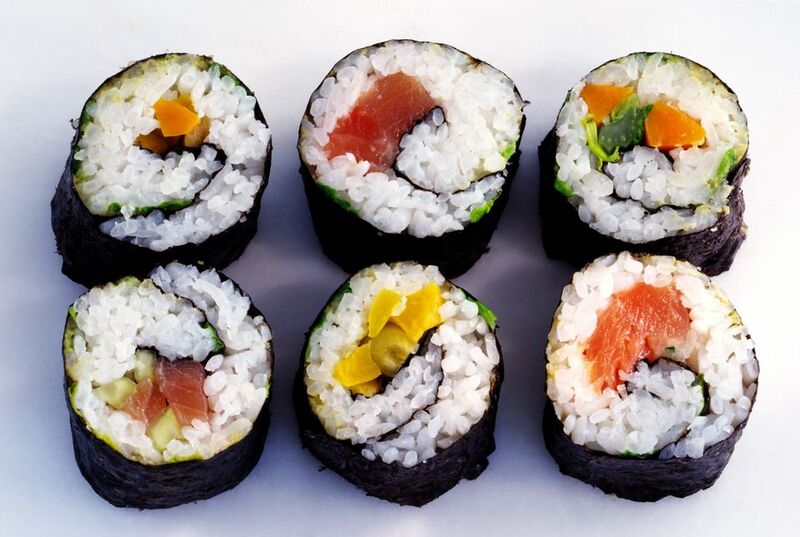 Roll it forward to make a complete roll. Repeat with remaining ingredients. A very easy chicken recipe you can pack for lunch. This recipe can be prepared within 35 minutes. You can serve it on dinners and lunch for very special occasions. Mix together the mayonnaise, cucumber, 1 tablespoon of honey, 1/2 teaspoon of cayenne pepper, and black pepper in a bowl until smooth. Cover and refrigerate until needed. Heat the olive oil in a skillet on medium-high heat, and cook and stir the chicken breast strips until they are beginning to turn golden and are no longer pink in the middle, about 8 minutes. Stir in the salsa, 1 tablespoon of honey, and 1/2 teaspoon of cayenne pepper. Reduce the heat to medium-low and simmer, stirring occasionally, until the flavors have blended, about 5 minutes. Stack the tortillas, 4 at a time, in a microwave oven and heat until warm and pliable, 20 to 30 seconds per batch. Spread each tortilla with 1 tablespoon of the mayonnaise-cucumber mixture, top with a layer of baby spinach leaves, and arrange about 1/2 cup of chicken mixture on the spinach leaves. Fold the bottom of each tortilla up about 2 inches, and start rolling the burrito from the right side. When the burrito is half-rolled, fold the top of the tortilla down, enclosing the filling, and continue rolling to make a tight, compact cylinder. 1/4 cup butter, melted 1/4 cup coffee-flavored liqueur, divided 3 (8 ounce) packages cream cheese 1 (8 ounce) container mascarpone cheese 1 cup white sugar 2 eggs 1/4 cup all-purpose flour 1 (1 ounce) square semisweet chocolate 1 (12 ounce) package ladyfingers Preheat oven to 350 degrees F (175 degrees C). Place a pan of water on the bottom of the oven. Crush the package of ladyfingers to fine crumbs. Mix the melted butter into the crumbs. Moisten with 2 tablespoons of the coffee liqueur. Press into an 8-inch springform pan. In a large bowl, mix cream cheese, mascarpone, and sugar until very smooth. Add 2 tablespoons coffee liqueur, and mix. Add the eggs and the flour; mix slowly just until smooth. Pour batter over crust in the spring form pan. Place pan on middle rack of oven. Bake until just set, 40 to 45 minutes. Open oven door, and turn off the heat. 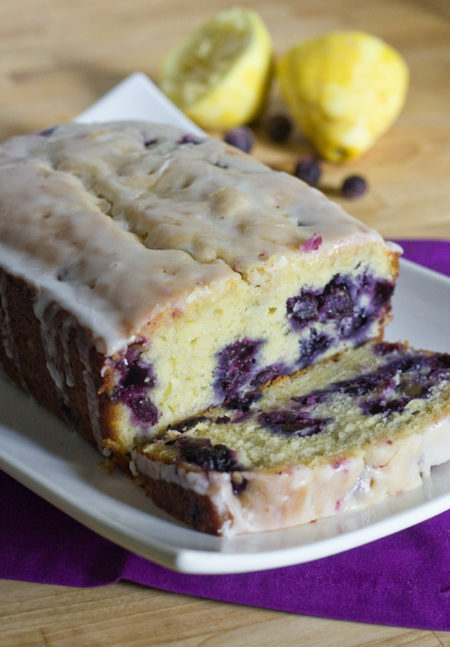 Leave cake to cool in oven for 20 minutes. Remove from oven, and let it finish cooling, about 30 minutes. Refrigerate for at least 3 hours, or overnight. Grate semisweet chocolate over the top right before serving. And voila! It is ready to serve! Preheat the oven to 350 degrees F. In a dry skillet, toast walnuts over medium-high heat for 1 to 2 minutes. In a large bowl, combine all-purpose flour, baking powder, baking soda and salt. Whisk to combine. In a medium bowl, combine sugar, lemon zest, buttermilk, eggs, vanilla, melted butter and oil. Whisk just to combine. Make a well in center of dry ingredients. Add liquid ingredients and mix gently just to combine; do not over-mix. Gently fold in walnuts and blueberries. Pour batter into a greased and floured 8 x 4-inch loaf pan. Bake in preheated oven for 55 to 60 minutes or until tester inserted in center comes out clean. Cool on rack for 20 minutes; remove from pan, cool to room temperature. To make the glaze, combine sugar and lemon juice in a small saucepan. Bring to boil over high heat, then reduce heat and continue stirring until sugar dissolves. Brush glaze over bread while still warm. 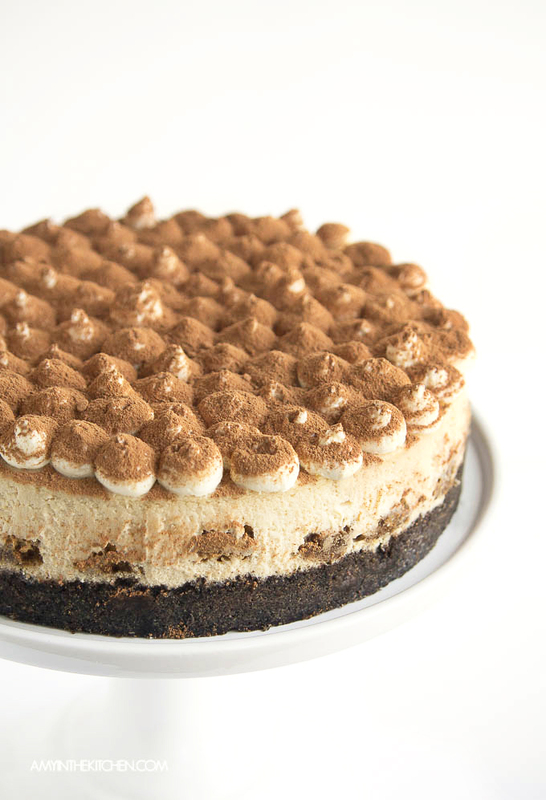 A very easy dessert you can serve on holidays! It’s a moist buttery cake with a luscious butter sauce; This dish can be prepared in just 2 hours. Preheat oven to 325 degrees F (165 degrees C). Grease and flour a 10 inch Bundt pan. In a large bowl, mix the flour, 2 cups sugar, salt, baking powder and baking soda. Blend in buttermilk, 1 cup of butter, 2 teaspoons of vanilla and 4 eggs. Beat for 3 minutes at medium speed. Pour batter into prepared pan. Bake in preheated oven for 60 minutes, or until a wooden toothpick inserted into center of cake comes out clean. Prick holes in the still warm cake. Slowly pour sauce over cake. 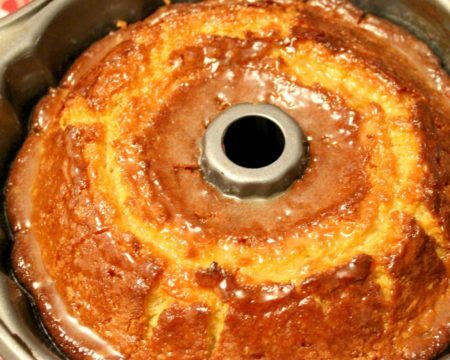 Let cake cool before removing from pan. To Make Butter Sauce: In a saucepan combine the remaining 3/4 cups sugar, 1/3 cup butter, 2 teaspoons vanilla, and the water. Cook over medium heat, until fully melted and combined, but do not boil. Disney World is building a restaurant that will make you feel like you’re dining in space. The restaurant will be adjacent to Mission: SPACE in Disney World’s Epcot. 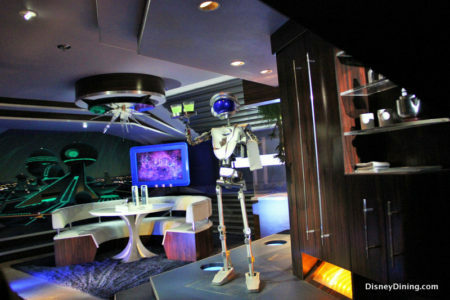 The restaurant will take guests on a trip that will make them feel like they’re in space. A lot of updates are coming to Walt Disney World’s Epcot park in Orlando, Florida in the next few years to celebrate its 35th anniversary. 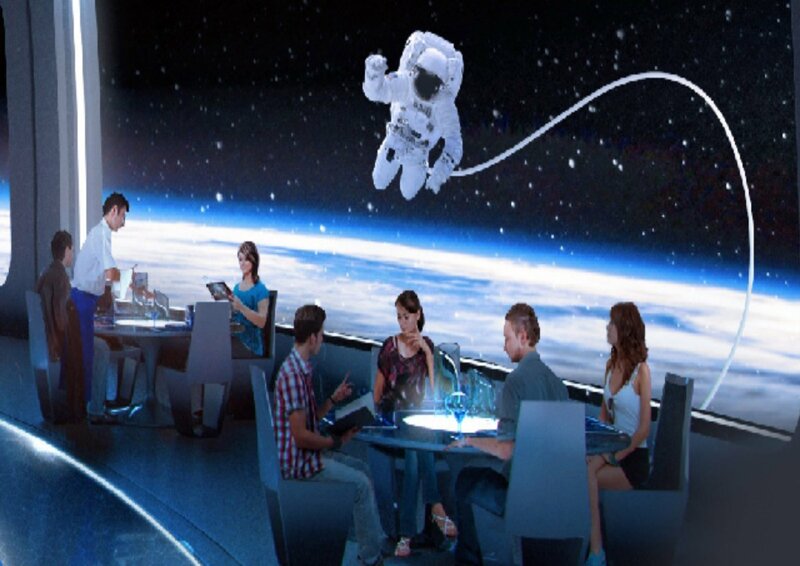 The restaurant will invite guests to travel into space for amazing dining experiences in the stars. According to an executive the restaurants will be really out of this world. The new space restaurant will be operated by the Patina Restaurant Group. Patina Restaurant Group operates several other restaurants at Disney World including Tutto Italia and Via Napoli at Epcot and Morimoto Asia at Disney Springs. Until now the name of the restaurant was still confidential. But according to reports the restaurant will be open by the time Disney World celebrates its 50th anniversary in 2021. And they will be offering new table service restaurant that will invite you to travel high above the Earth where you’ll enjoy great meals and an even greater view. According to rumors ,when guests look out the windows in the venue, they’ll see space in every direction. It sounds very similar to the technology Disney’s Imagineers will use to bring a similar immersive experience to its upcoming Star wars Hotel.